Proof coins are the epitome of the minter’s art, with frosty designs and glamorous, mirror-like fields. Piedforts are coins struck with double-thick planchets for a luxurious heft not found on standard coins. 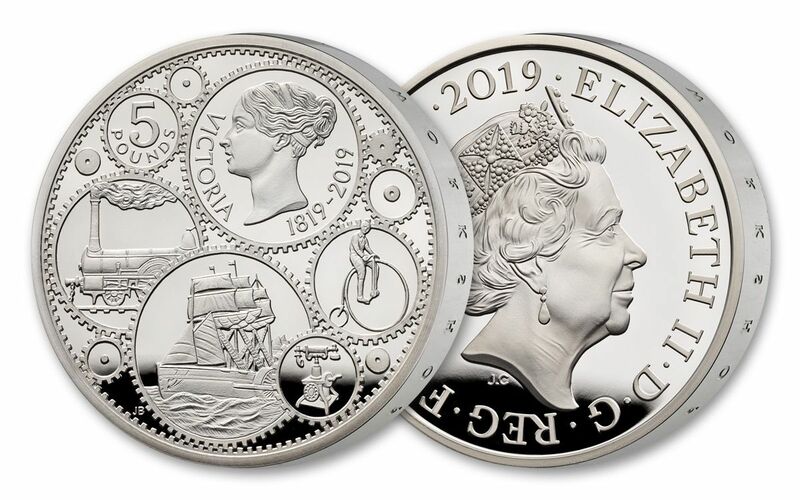 Put them both together, strike them in 92.5% Sterling silver and add five new beautiful designs and you have the limited-edition 2019 Silver Proof Piedfort Five-Piece Commemorative Coin Set from The Royal Mint. The 200th birthday of Queen Victoria, who took the throne when she was just 18 and reigned from 1837 until 1876. The 75th anniversary of the D-Day landings on June 6, 1944. The 350th anniversary of the final diary entry by Samuel Pepys, a witness to the Restoration, the Plague and the Great Fire of London. The 260th anniversary of the formation of Wedgwood, a fine china and porcelain company founded in 1759 amidst the early years of the Industrial Revolution. The 160th birthday of Sir Arthur Conan Doyle, creator of Sherlock Holmes and the father of modern crime fiction. 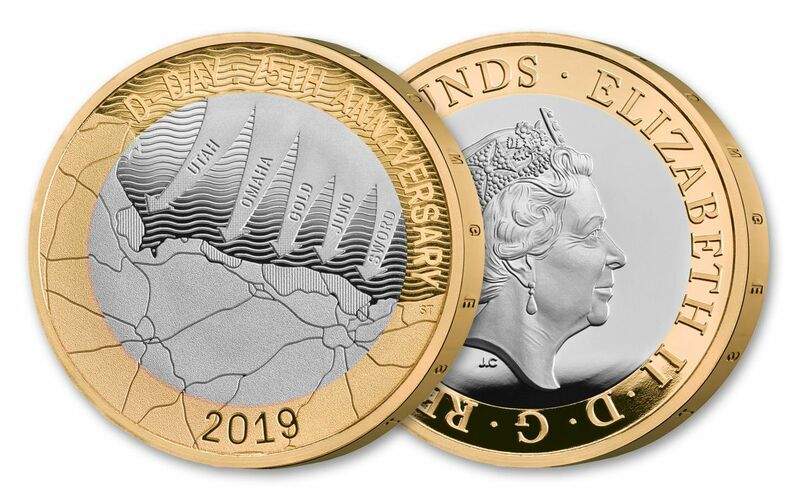 Each coin features an intricate design and is official legal tender. Only 1,000 of these sets exist, making them highly prized among collectors. Don’t miss out! 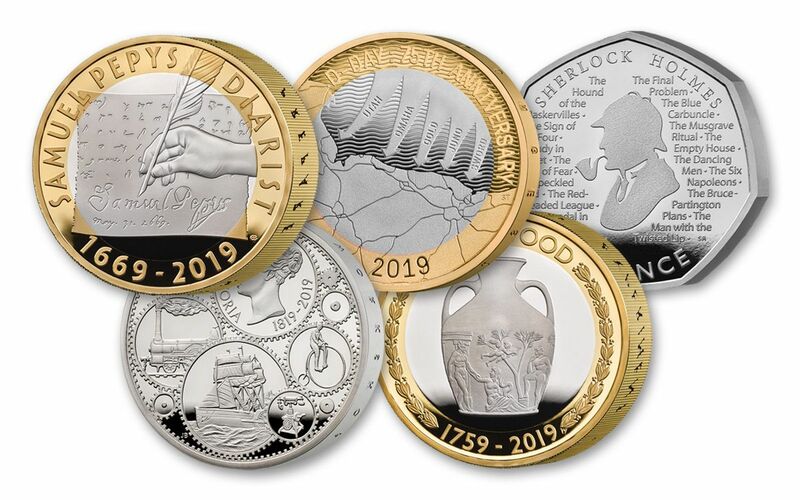 FIVE COINS, FIVE ANNIVERSARIES – The five coins in this set each pay tribute to a different anniversary milestone in Great Britain with one-year-only designs: The 200th Anniversary of Queen Victoria’s birth, the 75th Anniversary of the D-Day Landings in World War II, the 350th Anniversary of Samuel Pepy’s last diary entry, the 260th Anniversary of the Wedgwood Industrial Revolution and the 160th Anniversary of the birth of Sir Arthur Conan Doyle, creator of Sherlock Holmes. STRUCK IN STERLING SILVER – These coins were each struck in 92.5% British Sterling silver – a total weight of 4.65 ounces for the entire set. 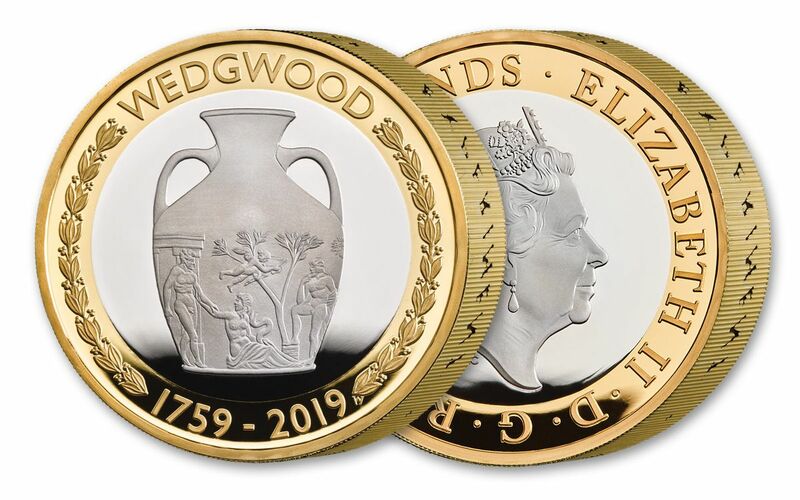 The D-day, Samuel Pepys and Wedgwood coins also feature an outer ring plated in 22-karat gold. LEGAL-TENDER COINAGE – Each coin is legal tender in Great Britain. 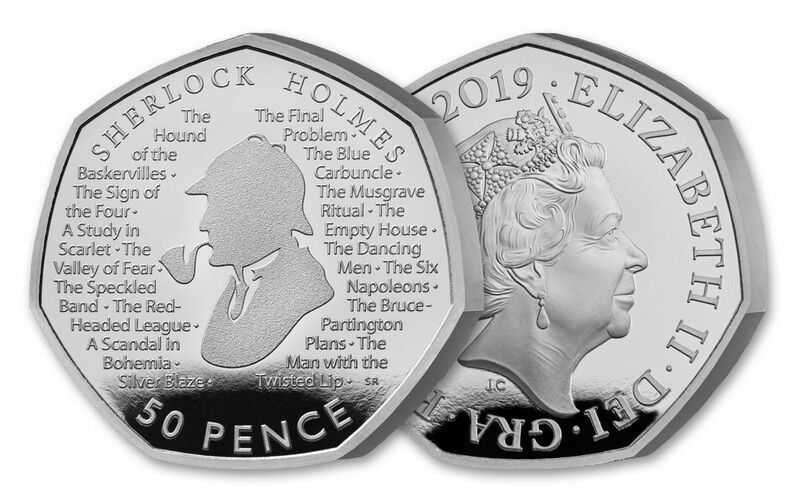 The 38.61 mm diameter Queen Victoria coin bears a £5 denomination, the 28.4 mm D-Day, Samuel Pepys and Wedgwood coins bear a £2 denomination and the 27.3 mm Sherlock Holmes coins is a 50 pence piece. EXTREMELY LIMITED SET – Just 1,000 sets have been assembled for worldwide release. 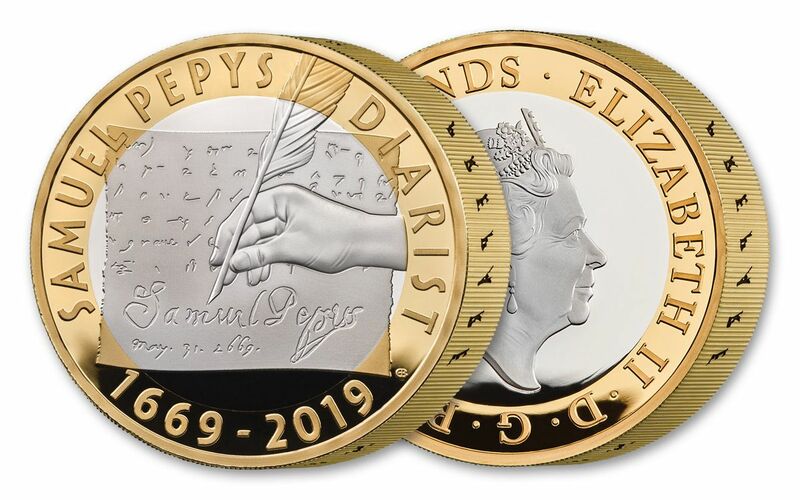 Great Britain’s 2019 Silver Proof Piedfort Five-Piece Commemorative Coin Set pays tribute to not just one milestone in English history, but FIVE milestones! With just 1,000 sets for the entire world, the time to get one of these sets is now. Click one to your cart right now!